There are two world views on this planet. Two starting points that lead to just two types of men. There is the world view that success, however that is defined, is dependent upon us. There is a standard we must meet by our choices to reach our goal of fulfillment, happiness, freedom, heaven, conservative government, liberal government, moderate government, 72 virgins, good marriage, hot lover, big house, beautiful well-mannered kids, good food, respect, fame, money – whatever standard of success you or the crowd you run with has determined as “it” – there is that set of standards by which we judge ourselves and everyone else. Under that worldview, you are constantly working to achieve perfection in those standards and looking down on everyone else who does not share those standards and who is not striving to meet those goals. The religion of human achievement, whatever form it takes, is the most dominant worldview. It is the core principal in Buddhism, Islam, Judaism, Roman Catholicism, liberal Christianity, Hinduism, Wicca, Scientology, legalistic fundamentalist Christianity, Atheism, Agnosticism…you get the picture. Each of these says I can achieve [insert metaphor for Heaven here] by what I do. In this worldview, we are all hypocrites. We know that we’ll never be good enough to achieve the ideal, yet we ridicule others whom we perceive to be further down the chain than us toward the ideal. Liberals ridicule conservatives as intolerant cavemen. Conservatives ridicule liberals as air-headed extremists who have no concept of cause and effect. And both keep working, working, working…toward human achievement that never fully arrives. Then, there is the other world view. I have been working at memorizing the book of Ephesians lately. I’ve stopped and started quite a few times over the years, but I have actually stuck with it for an extended time here lately. When I’m practicing, sometimes I don’t get all the way through because I start thinking through Paul’s train of thought. If you’ve never read it, the Bible is not just a series of disjointed statements. There is a logical flow moving toward an end. Each of the 66 books has a point and the content was placed in the order it was placed for a reason. That is especially obvious in Paul’s letters to the churches. So, I was walking with the dogs one morning, reciting Ephesians, and I got stuck around chapter 2. Not that I couldn’t remember what was written, it just hit me. Here it is. Now, what hit me is by no means new. I guess I’ve always known this. But, it hit me for real. Christianity is the only worldview that promises heaven based on what God has done, not what man is doing. Specifically, the accomplishment of the Person of Jesus Christ. Christianity is not a set of moral ideals or regulations. It is the result of Divine purpose, selection, and ultimately the created transformation of a people remade to be like One Man. He Himself is our peace. Peace? Isn’t there war in the Middle East? Genocide in Africa? Oppression in China? Land grabs in the Ukraine? Where is this peace? The peace about which Paul is speaking is peace with God. Paul talks about it earlier in chapter 2. By nature children of wrath. Whose wrath? God’s wrath. But, I thought God is love. How can God judge anyone? Well, I have posted on this elsewhere. Suffice it to say that we are all born condemned by God because our nature is one of rebellion against Him. We act upon that nature and worship created things rather than the Creator. (John 3:17-18, Romans 1:24-25) Those created things – Mother Earth, trees, animals, the human body, chemical escape from reality – or things formed by our hands – work, politics, the ambiguous idea of “freedom” – all of these things are simply lesser gods and not worthy of the devotion that we give them. Thinking that we are free or seeking to be free, we become slaves to the temporal and blinded to the eternal. After laying out the deadness of our hearts in rebellion against God, Paul then pens probably the best two words in all of Scripture – But God. All of the geopolitical dreams of peace can only be fulfilled in Him. You will never solve the Israeli – Palestinian issue until Jew and Palestinian no longer see themselves as Jew and Palestinian, but see themselves as Jewish brother in Christ and Palestinian brother in Christ. He Himself is our peace, Who has made us both one…the focus in Christianity is a Person. Not a set of ideas, but The Ideal. We see this in the radical new society created as the New Testament Church. How can you put a devout Jew and a sexually promiscuous Greek together in such a way that they view each other as family and no longer moral enemies? I find it interesting that Paul equates the sin of homosexuality with reviler and swindler. To mock and distort the created order by our lives is the essence of rebellion against God. Sin is sin. Some are more obvious than others. Nevertheless, none who practice such things will ever achieve the good and perfect that they were created to seek. But, even those who have lived what we consider the vilest of lives are not without hope. How about you? 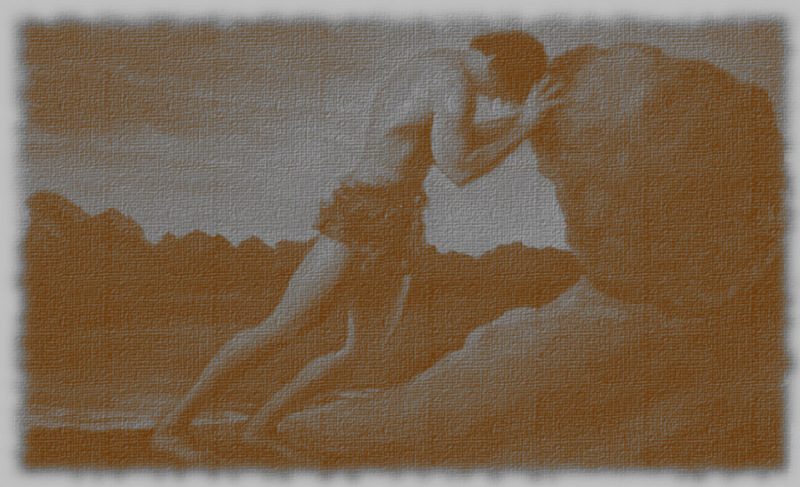 Do you keep rolling that stone uphill only to have it fall to the bottom again? Put your trust in Christ, not in your own effort. Trust that in your place He stood condemned on the Cross and absorbed the full judgment of God that you deserve even now.